Do the Caps Need a New Captain? following the footsteps of a very select group of people.” – Rosemount Hockey Captain’s Manual. It can’t be easy to sport the “C”. 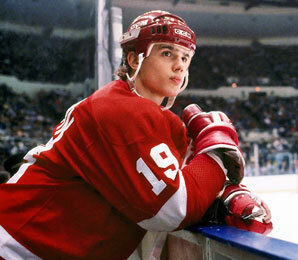 Just ask Steve Yzerman – one of the youngest-ever captains of an NHL team and still the longest-serving. Yzerman played in 1,514 regular-season games, scoring 692 goals and racking up 1,755 points – sixth most in NHL history – and all of them in Detroit. He was a player’s player. And perhaps that’s what made him the player’s captain. “He’s been a great Red Wing. He’s been a humble Red Wing. He’s been a leader by example,” said Wing great (and Hall of Famer) Ted Lindsay of his former team-mate. It may be the thing to lay down hate on the Wings…but no doubt that’s got something to do with their talent. The Red Wings have rarely been bad. Mostly they’ve lived somewhere between good and great, and from Gordie Howe to present day they’ve attracted some of the best to ever hit the ice. So it might be hard to remember that for years the Wings were the too-talented-but-can’t-clinch-the-big-game crew, the team that choked. The “Dead Wings.” The squad with the explosive style that just couldn’t pull it together when it really counted. (Sound familiar?) By 1982, it was obvious to their new owner, pizza-baron Mike Ilitch, that the Wings needed a serious rebuild. Soon after, in 1983, Steve Yzerman first laced up in the Motor City. There was no doubt the young Canadian had skills – and Yzerman wasn’t the only one. Coach Scotty Bowman had been brought in by owner and pizza-baron Mike Ilitch to figure out a way to translate those skills into wins. Part of his solution: make Yzerman team captain. Three years later, in 1986, Yzerman first donned the C. It took ten more years before he and his teammates hoisted the Stanley Cup overhead at the Joe. Then they did it again. And again. In Detroit, everyone knew exactly who “The Captain” was. Take it now back home. Bruce Boudreau becomes Capitals coach in late 2007. 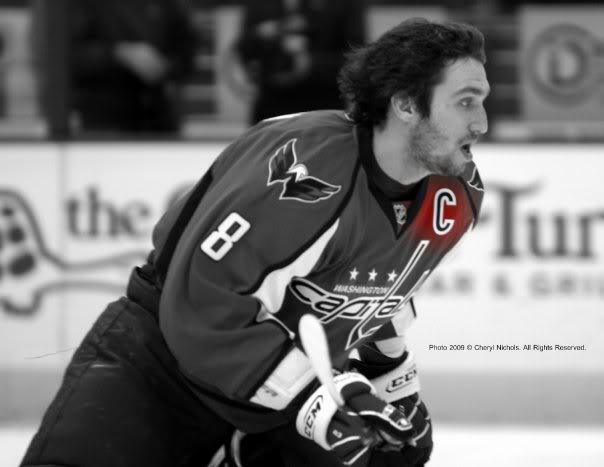 Alex Ovechkin makes captain in January, 2010. The third-youngest current NHL captain, and the first born in Europe for the Caps. What can Hockey Capital learn from Hockeytown? Let’s see: team loaded with star players, but can’t seal the deal when it counts. New(ish) owner decides it’s time for a re-build. New coach brought in to re-jigger play. New captain named – a young, foreign-born superstar – who has (so far) played all of his NHL games for the same team, and just several years into his tenure. There’s been a lot of discussion lately about what the Capitals need to bring the Cup to DC. A new coach. A new player lineup. A new style of play. But maybe, just maybe, they need a new captain? Unlike most other sports, the hockey captain isn’t just a ceremonial post. Sure, it’s a nod from the front office to someone special, but captains have to perform in order to get the team to perform. Captains don’t get extra money, extra time or extra anything – except responsibility. Capitals Director of Media Relations Sergey Kocharov makes it clear to us that being captain is NOT any part of Ovechkin’s contract. Rather, he says, like many (but not all) NHL teams it’s the GM’s decision – and in this case, only after consulting with Coach Boudreau and with some input from the players. Technically, captains are the only ones permitted to talk with the refs on the ice – hence the rule that captain’s can’t also be goalies (Luongo not withstanding.) More than just a leader in the locker room, captains are the go betweens of management and players. If there’s a problem somewhere on the team – on or off the ice – it’s expected the captain will try to do something about it. For Boudreau, and several of his teammates, there was no other choice but Ovechkin. But that was 2007 – is there really no other choice today? Alex earned the right to first wear the “C”, but has he earned the right to keep it? There’s no doubting Ovechkin is still a serious draw. #8 is a large reason the Caps are on their sellout streak. Just look at the stands – we defy you notto see an Ovechkin sweater. And he’s still the guy “taking care of the ice.” As the sharpies over at RMNB recently noted, 2011 clearly wasn’t Ovie’s best year: “No Hart nomination. No Lindsay, Art Ross, or Richard trophies either — none of the individual accolades we are used to seeing from the game’s most dynamic player,” writes Neil Greenberg. That said, he remains one of the NHL’s best, the Cap’s central pillar, and is still capable of greatness. “Boudreau’s captain has not taken accountability for a lackluster effort put forth by the entire team and a lot of the blame should be shouldered by Alex Ovechkin. A captain can be targeted for a failure of leadership – that’s fair. But can a team’s failure always be pinned back on the captain? Clearly not. Sometimes, the leadership failures extend up the chain beyond the locker room. Sometimes, you just have a few inconsistent – or worse, lazy – players. Ahem. If finding the source of the problem proves elusive, maybe finding the solution is clearer. Maybe Ovie should remain as captain, but his assistants should step up their game to help bolster the team. We already know Knuble seemed to take to the role of Team Papa, lighting fires where they needed lighting, listening to players who needed to be heard. How much help were Chimera and Backstrom? That’s just unclear. Would Arnott – assuming he’s even around next year – continue to step up? 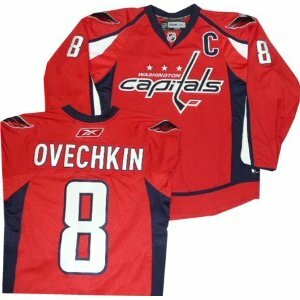 In the end, Ovie may not be the very best leader the Caps need off the ice right now, but ripping the “C” off his jersey might prove so disruptive – so disheartening for him and his team – that it’s just not worth the risk. Part of the burden of wearing the “C” is exactly this sort of scrutiny. Maybe the guys with the “A’s” is where the answer lies. In 2006, aging and battling injuries, Steve Yzerman stepped down as captain and as a Wing. He left big skates to step into – both as a player and captain. ”I don’t think, ‘What do I do to lead this team today?’ We just kind of go out and play.” Other members of the Wings see Yzerman’s role a little differently. Soon after, Scotty Bowman announced that Nicklas Lidstrom would be the Wing’s new “C.” Lidstrom has played every one of his professional games in Detroit. He’s lifted the Cup at the Joe, and in 2008, he broke Yzerman’s franchise record for most playoff games. That Lidstrom is currently the NHL’s best captain would be hard to argue against. The Wings didn’t win the Cup this year, but they’ve come closer than the Caps every year this past decade. And Yzerman? He’s done in Tampa what Washington sorely needs: someone to weld a collection of players into a team. This entry was posted in Uncategorized, Washington Capitals and tagged Alex Ovechkin, leaders, O Captain My Captain!, Ovie's not going to like us, Red Wings. Bookmark the permalink. Motivation is a hugely overrated concept. The playoff collapses aren’t on the head of the captain doing the motivation — his job there being exactly the same as in the regular season where he’s done great — but that of the strategist, the coach, whose job actually is different in a playoff series against the same team over and over from the regular season with a different opponent every night. Ovi should keep the C, but a mistake is already getting made in not letting Boudreau go. Anyone who has ever played this game will realize that the Captains job isnt always to motivate in the locker room. Sometimes he leads by example, sometimes he leads by motivation, and sometimes he doesn’t have to lead at all because the team is full of natural leaders. From what I see here, this is just another cheap shot at an obvious target. 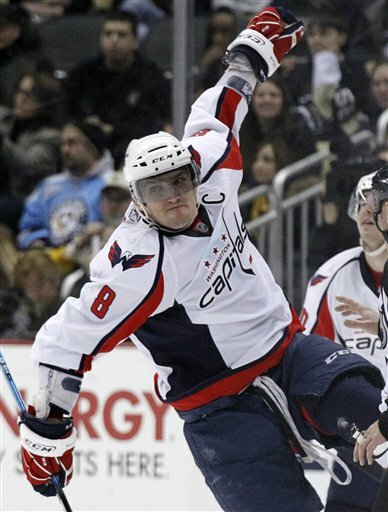 Ovechkin gives his heart and soul every night on the ice. If People in Washington cannot see that, then they don’t understand the game and don’t have any business commenting or even writing about it. The problem with the capitals begins at the top, and trickles down from there. Leonsis created these expectations on such a young team, McPhee doesn’t have the knowledge to put together a winning combination of complimentary players, and Boudreau can’t coach outside of the box once things get a little screwy. …Well, You can’t change owners, and you can’t fire the players….